BOLD MONKEY: New Release: Tim Peeler Wild in the Strike Zone: Baseball Poems. Rank Stranger Press, Mount Olive North Caroline, 2016 (142 pages). 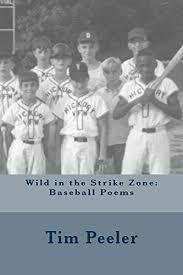 New Release: Tim Peeler Wild in the Strike Zone: Baseball Poems. Rank Stranger Press, Mount Olive North Caroline, 2016 (142 pages). This is Tim Peeler’s 14th book and his third book of baseball themed collection of poems, which follow his highly regarded Touching All the Bases and Waiting for Godot’s First Pitch. You will find a diversity of highly accessible poems in this collection but a general knowledge of baseball code and history will greatly enhance your enjoyment of the book.